Natural teeth are the “equipment” mother nature has given us, to help us process our food. They also help us speak clearly. As a doctor I take special care to help preserve nature’s gifts for as long as possible, in a minimally invasive way. 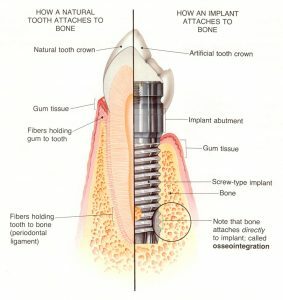 When this is not possible anymore or the prognosis of a compromised tooth is poor, I will resort to more aggressive techniques such as teeth extractions and placement of dental implants. I view dental implants as the ideal option to replace missing teeth, that lead to significant improvement in my patient’s quality life. But extracting perfectly salvageable teeth with the aim of replacing them with dental implants, is a practice that I do not recommend and is not based on sound scientific evidence. Oral implants when evaluated after 10 years of service do not surpass the longevity of natural teeth even of those that are compromised, for either periodontal or endodontic reason. Teeth suffering endodontically that are successfully treated- via a root canal and resin or crown restoration, present high survival rates (up to 97%) that are comparable to those for a single crown implant restoration. Dental bridges that are fixed on natural teeth behave similarly in the long run to dental bridges fixed on dental implants. Several studies have shown comparable long term survival rates of around 90%* for dental bridges, that use either natural tooth or implants as abutments. Key to the restorations success remains the existence of healthy well maintained periodontal tissues. *Survival rate of fixed prostheses supported by tooth and implants were found to be at 89.2% and 86.7%, respectively (Pjetursson, et al., 2007). Studies where teeth with reduced but healthy periodontal tissues were used as abutments in cross arch bridges (Laurell, et al., 1991; Lulic, et al., 2007), showed survival rates of up to to 90% over 10 years. Implants do not have a better prognosis than teeth with reduced marginal bone support. The dentist should not recommend extraction of such teeth. There is no evidence available to support an aggressive approach in early extraction of teeth, to preserve bone for later implant placement. Teeth may suffer from periodontal decease and implants from peri-implantitis or peri-implant mucositis. All these conditions can lead to tooth or implants loss, if not treated appropriately. Periodontal treatment followed by good oral hygiene and regular check-ups, is absolutely necessary to ensure the longevity of all fixed dental restorations. Dental implants feel and behave differently inside the mouth, because they lack the natural elasticity of the teeth. Teeth are surrounded and supported by specialized tissues (periodontium) that maintain them in the jaw bone. This unique structure helps teeth behave in an elastic way during chewing and biting. Dental implants on the other hand are rigidly fixed on the jaw bone. Preserving natural teeth is a lower cost alternative. Dental implant surgery can cost two or three times as much as root canal treatment, that is typically required to preserve a natural tooth. Additionally implant supported prostheses are more expensive than other prosthetic restorations. The daily cleaning of your natural teeth is easier and more effective than cleaning a prosthetic restoration on dental implants. Dental implants are my treatment of choice when it comes to replacing missing teeth or stabilizing ill-fitting dentures. They instantly improve my patient’s satisfaction and self- confidence. But for compromised teeth with a good treatment prognosis, maintaining them for as long as possible is my biggest priority. After all, I can always restore a diseased tooth with an implant as necessary at a later stage.